Fun lovers, thrill seekers and those longing for adventure needn't travel far to find that bit of excitement. Go Ape is the perfect way to face your fears, experience that adrenaline rush and swing through the trees. From starting up their business in a small cabin in Thetford forest, Go Ape has now made 31 sites their jungle home and are celebrating their 15th birthday. And I was lucky enough to join in the celebrations, and help mark their 15th year of helping adrenaline junkies and those up for a challenge. This weekend was the first day of my Easter break - a much anticipated day after weeks spent in the library while stressing out to the max. When I got invited to try my very own tree top adventure, I knew that I would be needing to let off a little steam this weekend. 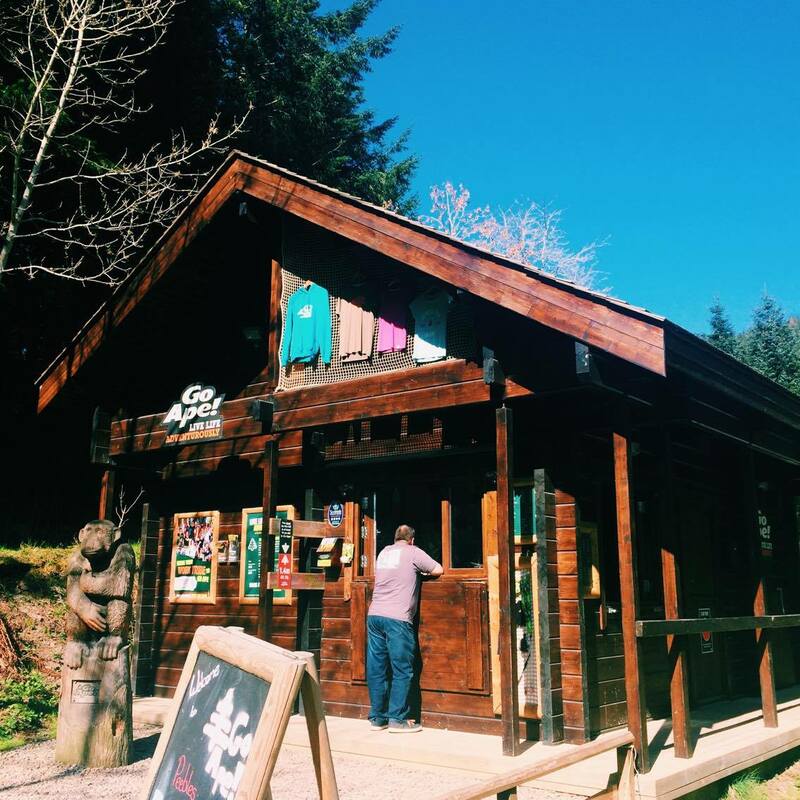 So this Saturday I hopped on the bus with my sister in tow and headed for Peebleshire, where Glentress Forest is home to a Go Ape site. Although its a longish bus ride from the centre of Edinburgh - taking 1.5 hours - it was a beautiful ride, and we got to see parts of the countryside that we otherwise wouldn't have seen. We also made a day of it, and after our adventure we made the walk into Peebles and wandered around the town centre with an ice-cream before taking a break on the river bank. My time at Go Ape was incredible - although absolutely terrifying. It's not something I'd recommend for people with a fear of heights, but is great for anyone who likes to push their own limits and see how nimble they are while attached to a harness. 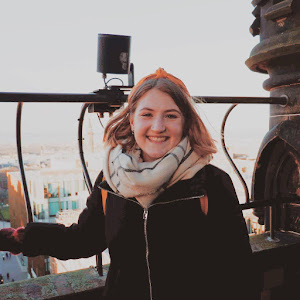 I've already been to the Aberdeenshire Go Ape, at Crathes Castle, so knew a little of what was in store - this way I was able to pump myself up and prepare for the fear that would inevitably hit. After some safety talks and demonstrations, we were left to start on our tree top trail with our group. While there, you're left on your own to work through the course at your own pace, scurrying up ladders, tip toeing across thin wooden beams, hanging by ropes and so on... At Glentress Forest, there are six different sections, all getting a little bit more tricky as you push yourself further and further. The course consists of obstacles of all kinds, from crawling through tunnels, balancing on ropes and beams, to swinging through hanging hoops. Each cross way (as they're called) offers something different to make your heart stop when you make the first step. My favourite parts of the whole course were the Tarzan Drops and the zip wire. There were two Tarzan Drops to try out - both sending you through the air before landing in a rope net that you then had to climb to reach the platform. Each of the 6 sections ended with a zip wire to bring you back down to the ground, starting from relatively small ones at the start to two massive ones at the end. 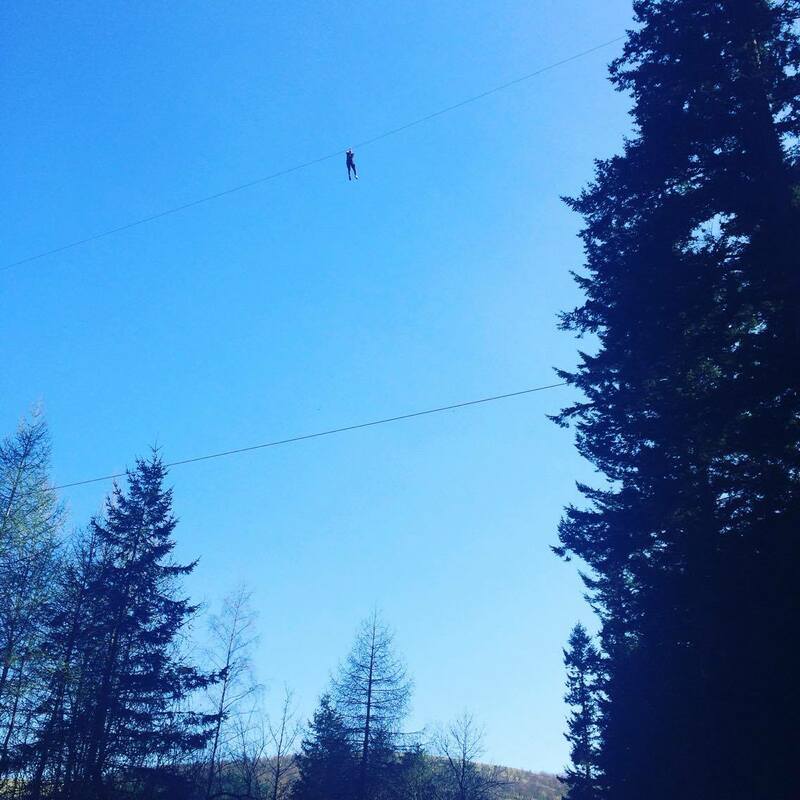 The Zip Wire at section 5 had to be the best - from high up in the trees, its the ultimate trust test as you let yourself take the step off the platform. You're then flown across a 300m wire, over a valley and reservoir to the other side, where your wobbly legs can relax as they hit the ground. Although it was terrifying taking the step off the 160ft platform, the feeling of flying through the air was incredible. We were lucky enough to be there on a clear and sunny day, which gave us beautiful views of the reservoir and forest. I was brave enough to throw my arms up and dangle there as I zipped along which was so amazing! I loved my adventure with Go Ape, and can't wait to book into my next adventure with them. It was a great way to let out all the stresses that have built up over the last few weeks, and was something different to do this Easter break. In total, it took us around 2.5 hours to complete the whole course, so would be a great way to spend the day out of the house, for kids (over 10 years old) or adults. Go Ape costs £33 for a Gorilla to take on the course (aged 16 and up) and £25 for Baboons (aged 10 - 15), so is a great way to treat yourself after a busy term at school or work. It was great to be a part of their 15th Birthday celebrations - 15 years of work have surely paid off and its become a fantastic nationwide adventure that is an award wining company. SO, do you think you're brave enough to clamber through the trees and test your limits? Find your nearest Go Ape adventure on their website, and book in for a fun way to spend your Easter break! Did you see that I'm heading up to Orkney this week as part of World Heritage Day? I'm one of Dig It 2017 six bloggers who are following the #ScotlandinSix events. Find out more here and be sure to stay tuned to hear about my adventures!